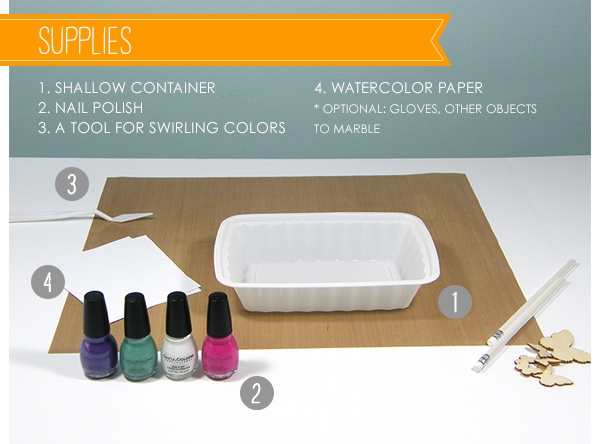 I have another requested tutorial featuring watercolor. 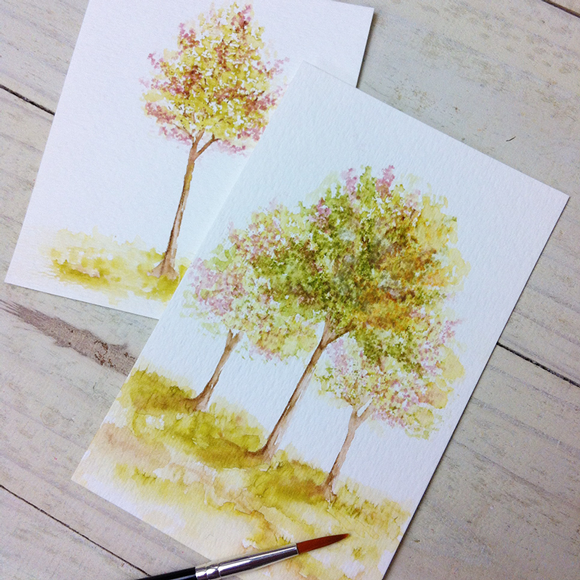 This time, I'm sharing an easy way to create these realistic trees using the Coming Up Roses stamp set. 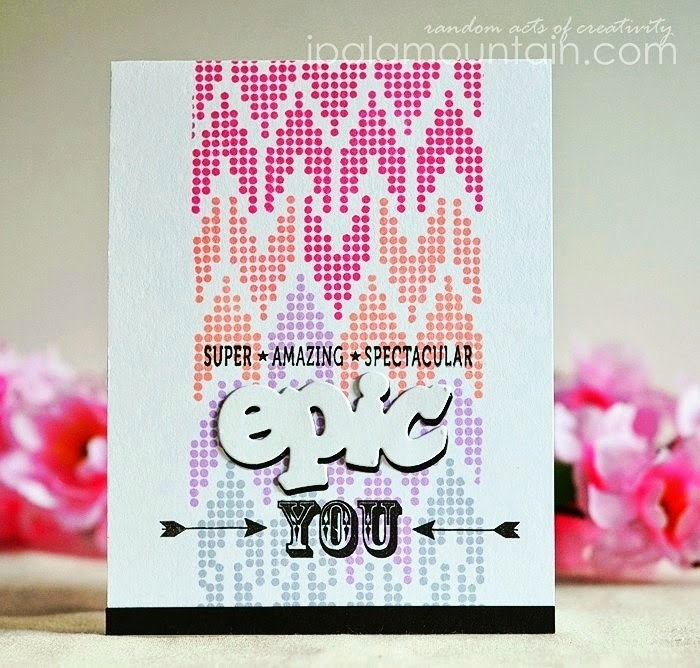 I am having a blast experimenting with our multi-step stamp sets! 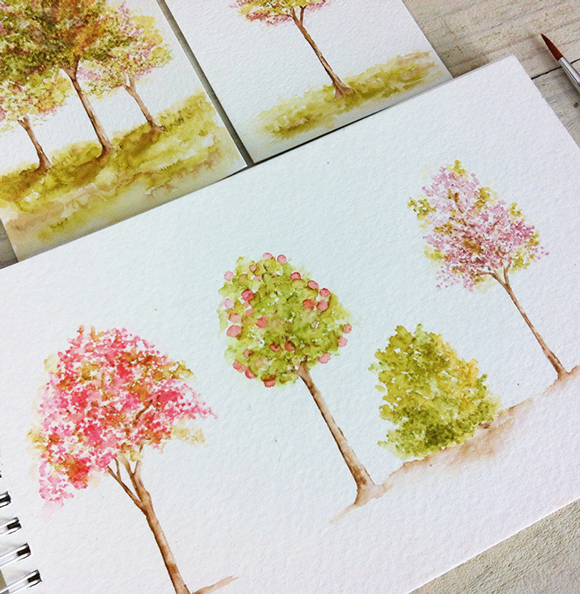 And I'm sharing not one, but four different types of trees that you can create. I'd love to see what you come up with! Thanks so much for stopping by today! Hi, It's Kara! Recently I have been experimenting with different mediums to create marble effects. My favorite so far is definitely the nail polish technique and I'm excited to share it with you. It's so easy, a little messy, but the effects are so beautiful. When you lift your paper up and look at your results you'll have one of those, "Ohhh!" moments. The results are different every time. Before you begin, make sure you are in a well ventilated area because the smell from the nail polish can be quite strong. If you've just gotten a manicure you might want to wear gloves. Chances are you'll get some polish on your hands. But, everything cleans up easily afterwards with nail polish remover. I like to shake all of my colors and remove the caps before I begin. You have some time, but do have to work quickly since the nail polish begins to dry. 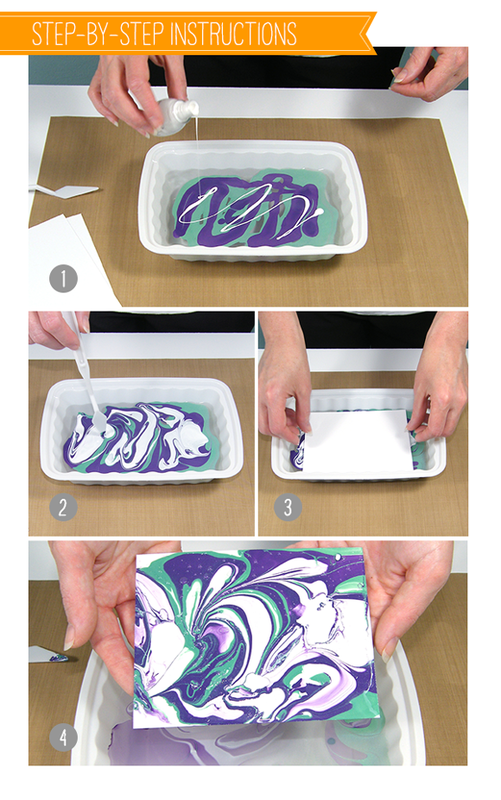 Drizzle each color onto the surface of the water with a steady hand. You want the polish to float on the surface rather than sink to the bottom of the container. Once you have added all of your colors use your tool to swirl the colors together until you are happy with how it looks. Lay your watercolor paper onto the surface of the water and lightly press making sure the entire surface of the paper makes contact with the polish and then lift off. Set the piece aside to dry. 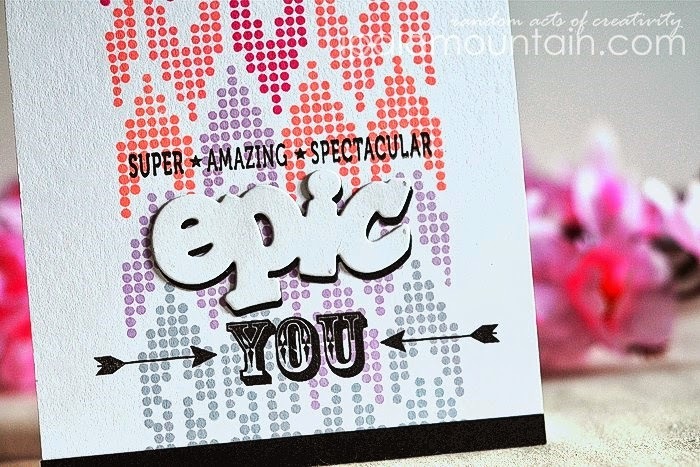 Once it is dry you can use it as a background, die cut it, stamp on it, glitter it, or anything else you can imagine! 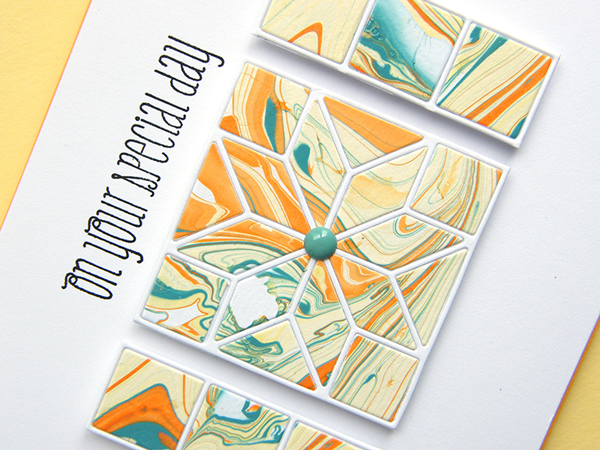 Here are a few examples of how I have used the marbled papers I have created. I hope you give this technique a try. Think beyond just paper. See those pencils and wood veneer butterflies? Yup, I marbled them too! Happy Mother's Day weekend everyone! I hope it is off to a great start! 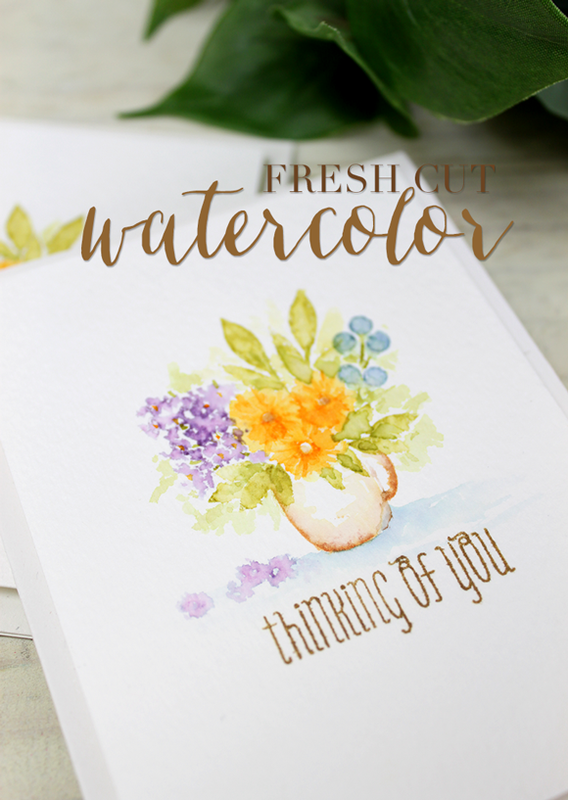 Today, I have a requested tutorial featuring Fresh Cut Florals and watercoloring. This is a deceptively easy technique. 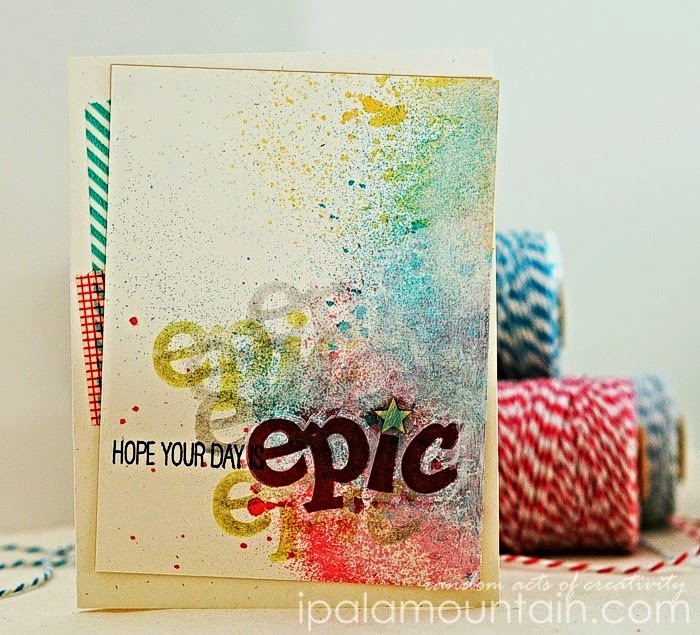 Watch below to see how you can use your stamps, Tim Holtz Distress Inks and a little water to create gorgeous cards with that hand painted look. You may have to experiment a little bit to figure out the water to ink ratio that you are comfortable with. Remember, there is not a right or wrong way and each result will be slightly different and unique. But once you get the hang of it, you'll be able to create these in no time. This example took me about 20 minutes from start to finish including drying time. I realize that we are out of stock on what seems like everything. We have several orders due in and should be fully restocked on almost everything in the store by the end of this month. In fact, we have several new wholesalers coming on and to keep up with demand, we will not be releasing any new stamps or dies in June. Instead, we are devoting the entire budget to restocking the store. We will however be releasing five new ink colors and re-inkers for all of our PURECOLOR dye inks! I find myself quite fond of that particular word die from Epic Dad. Once I pulled it out of the package I didn't want to put it away. On the card below I used it to create a 'shadow word'. I stamped the rays from the retired Super Star stamp set once on the panel and once on the die cut word, checking the alignment carefully. I also die cut the word with a strip of the pink cardstock at the bottom, it makes the further alignment a bit more fiddly but it's worth the fuss. I stamped the word 'dad' from the same retired set, in Lake House Dye Ink and the rays + the sentiment above the rays in Wild Mango. The pattern from Borders and Backgrounds 4 was stamped at the bottom of the panel in black. I finished the card by adding a few diagonal strips of White cardstock to the card base. I inked up Borders & Backgrounds 4 again here, in order to create a masked background on this stepped up one-layer card. I stamped the pieces in Sweet Gelato, Sweet Nectar, Bloomsberry and Silver Lining Dye Inks. Then I added a thin strip of black cardstock to the bottom of the card. I pulled out the retired Super Star stamp set once again, to stamp the wording above and under the Epic Dad die cut. I also stamped the arrows from Cupid's Arrow to accentuate the word. 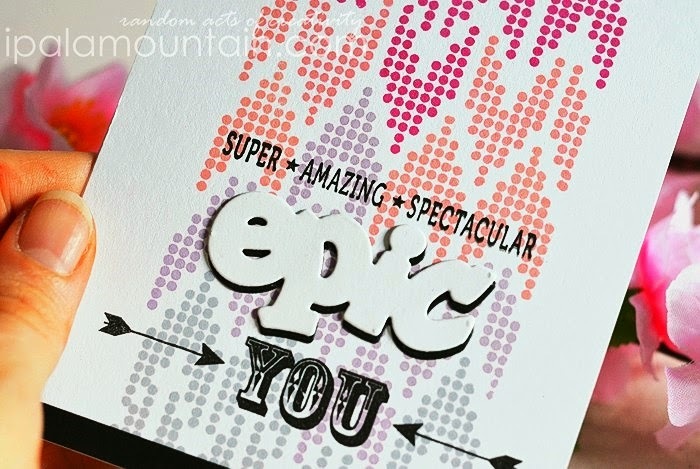 The word 'epic' was die cut once from white and once from black cardstock, and the pieces aligned to create a shadow. I misted the panel first, and once dry I applied a thin layer of white gesso over some of the misted areas to mute down and grunge the colours. Then I stamped the sentiment, partly in black and partly in White Pigment Ink & Cranberry Crush Dye Ink. I stamped the outline in white first, and then the filling in red. The effect is subtle but makes enough of a statement. 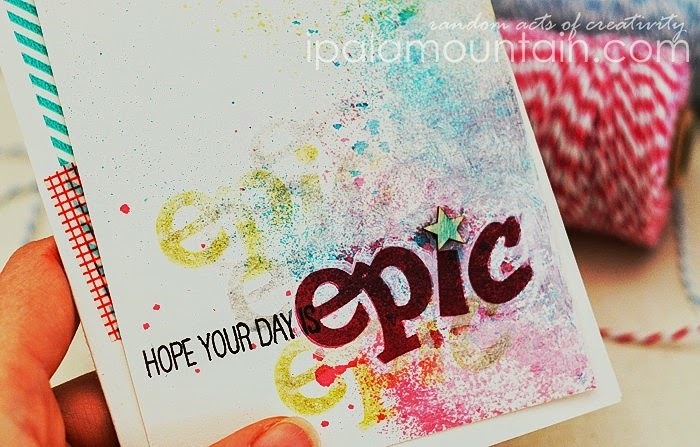 I also stamped he word 'epic' a couple more times around the sentiment, using the secondary stamping technique - I stamped off some ink on scrap paper first, and then on the panel with the remaining ink, thus making a lighter impression. I used Appletini and Silver Lining Dye Inks for this. I finished the card with some washi tape and a wood veneer star, which I smudged some more ink over. Thank you for joining me this week, I hope you had as much fun checking my cards out, as I had making them! 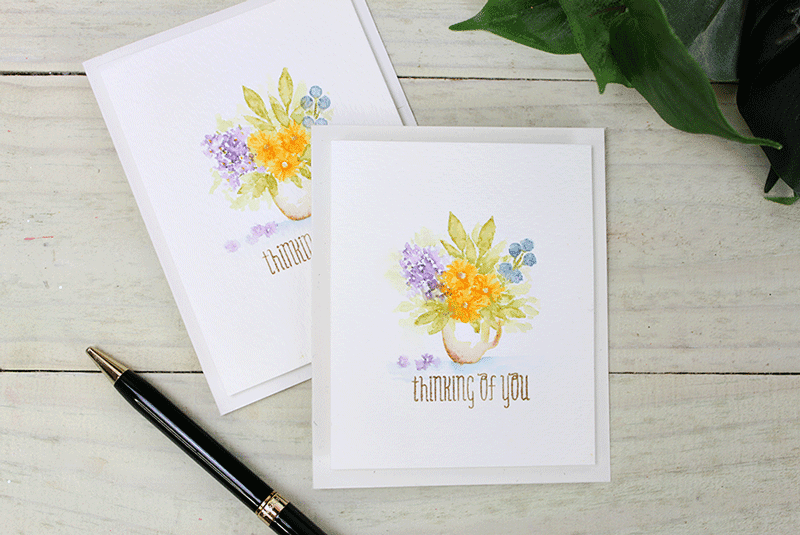 Hi it's Chupa again, I have a couple of colourful, feminine cards to share today! I used a Foliage Frame Die to frame a layer of polka dotted patterned paper, white embossed the sentiment from Hand Lettered Hello on the paper, and gave the butterflies from my old favourite - Fauna & Flora I, the same treatment. I white embossed them on a different piece of patterned paper, fussy cut and mounted inside the frame. I filled in the letters in the 'hello' word with a yellow Copic marker. The edges of the frame are glittered. I created them by applying strips of double-sided tape around the frame and coating them with fine loose glitter. Here I used a Hand Lettered Hello Die to die cut negative space in a White cardstock panel, and sponged red and orange Distress Inks on a scrap piece of cardstock underneath. 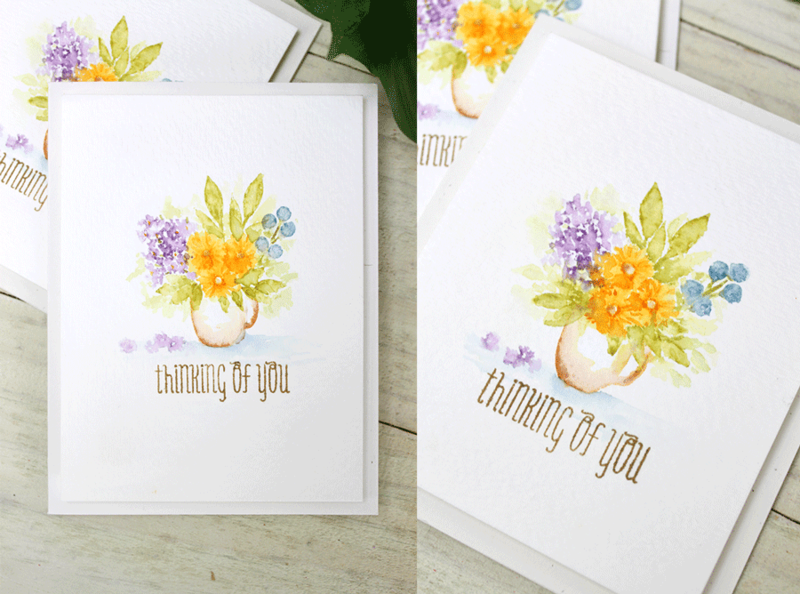 I stamped the foliage from Spring Blooms in Sweet Nectar Dye Ink, and added the sentiment from Hand Lettered Hello on a small ribbon banner from Banner Trio Die. Then I mounted the panel on an Oatmeal card along with a couple of layers of patterned paper. I finished the card by adding a flower arrangement, stamped with Spring Blooms stamp set and die cut with a companion die. See you tomorrow for a final day from me!